If you've got a fairly well stocked store-cupboard you should be able to rustle up a meal without having to go to the supermarket. There's nothing worse than standing in front of an open cupboard for 20 minutes, trying to put a few cans of random pulses and odd pasta shapes together to create a delicious dinner. With just a few well-chosen cans and jars you'll have a choice of meals that can be made in minutes. To make the store-cupboard really work you need to pay it a little attention every now and again. Make sure it's at least partially full of some essential ingredients. If you do a big supermarket shop with your housemates check which ingredients you're running low on and stock up. Better still, do an online shop and let someone else do the running around. A lot of supermarkets offer incentives or money-off vouchers for your first shop and some do free delivery if you book times during the day - perfect for students studying at home! This is a great way to buy all your bulky and heavy shopping and you can really make the most of special offers, as long as you have the space to store all the shopping. Cans last for ages so you won't need to worry about wasting food. You'll find a selection of essential store-cupboard foods below: stock up on these and you'll have a choice of meals. It goes without saying that you'll need a stock of these in your cupboard. Try to buy the same pasta shapes and don't have more than a couple of varieties. That way, you won't end up with loads of packets with just a few odd shapes at the bottom. 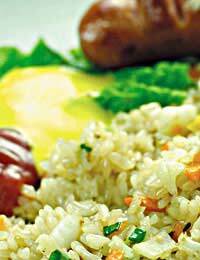 Brown rice is healthier for you and it's also really tasty so try it for a change. Again, don't keep too many different varieties of rice in the cupboard or you'll end up with odds and ends. If you haven't tried couscous before, give it a go - you might be pleasantly surprised. It's really quick and easy to prepare and can be served with pulses or as an accompaniment to meat and fish. Heat up a can of drained chickpeas, some cooked frozen peas, a few chopped sun-dried tomatoes and a small can of chopped tomatoes and serve it with couscous for a light, veggie supper. These are great for a quick stir-fry. Combine with any veggies you've got in the fridge and a jar of sauce and dinner's on the table in minutes! These make a great stand-by for when you run out of fresh. Peas, beans, sweetcorn, broccoli and spinach can all be used to make any number of great meals. Again, cans are a wonderful emergency resource. Chickpeas can be combined with a can of chopped tomatoes and some spices and served with rice; peas, potatoes or beans can be served with chicken or fish; and tuna or salmon can be used to create a quick pasta sauce or pilaff. With these essentials in your kitchen you won't need to dash out to the shops every time you fancy a quick dinner but haven't managed to get to the supermarket.